Nursing Sports Bra: This is an absolute must if you plan on breastfeeding. I had gone shopping at week 37 for nursing bras and picked up one of these at the recommendation of the sales clerk, not thinking I would use it much. Turns out that when I became engorged a few days after leaving the hospital none of the other bras I had purchased fit me and this was the only one that worked. Also, with the pain and sensitivity I experienced during the initial period of breastfeeding I found the sports bra style to be the most comfortable. I have since stopped wearing it during the day as I find that it doesn’t provide enough support, but I now wear it during the night and it works perfectly for a bedtime nursing bra. Saje Facial Cleanser: Once I found out I was pregnant I stopped using all my usual facial products that contained chemicals and opted for an all natural product instead. A co-worker of mine had recommended checking out Saje Natural Wellness and I quickly fell in love with their Fresh Start gentle facial cleanser. I use it in the morning and before bed and always make sure it’s part of my daily routine, even if I don’t get the chance to do anything more! Kate Spade Cross-Body Purse (closest version): I bought the Kate Spade Highland Place Mini Maria leather purse on a whim not knowing how much I would actually use it. I am a purse fanatic and love my giant purses which can carry my entire life in them but figured this one might be a good option for mom life. Also, I didn’t want to pass up the opportunity to use pregnancy as an excuse to the hubby for buying a new purse! Since venturing out into public with Emsley I have actually been using it a lot as I love having my hands free. It gives me the ability to push the stroller, enjoy a coffee, carry the car seat, or just hold my babe. Plus, it’s the perfect size for all the essentials! T-Shirt Dress: I bought this T-shirt dress from Old Navy while pregnant as it fit nicely over my bump, but since having Emsley it has been my go to as I transition back to my “old” body. It’s loose and flowy and doesn’t hug those areas that you might not want to have hugged just yet! Plus, it’s also super comfy and breezy for this hot summer weather! Medela Lanolin Tender Care: This was a life saver after initially starting to breastfeed. If you haven’t read my post “The Truth About Breastfeeding” you might not know how much pain I was in. This product was soothing and perfectly safe to use while nursing baby. I had packed it in my hospital bag and used it religiously from the beginning to help with the dryness and cracking. I also have a babe who sleeps with her mouth open, so it’s also been perfect for treating her dry lips. Belly Band: I was planning to buy a Belly Bandit but never got the chance as my babe showed up a bit early. So I instead resulted to wearing my maternity jeans with built in spandex bands as well as a pair of bicycle shorts under dresses to cinch everything in so I could feel more comfortable wearing my pre-pregnancy clothes. I have heard great things about this product and wish I would have picked one up earlier as I am sure they provide even more shape and comfort. 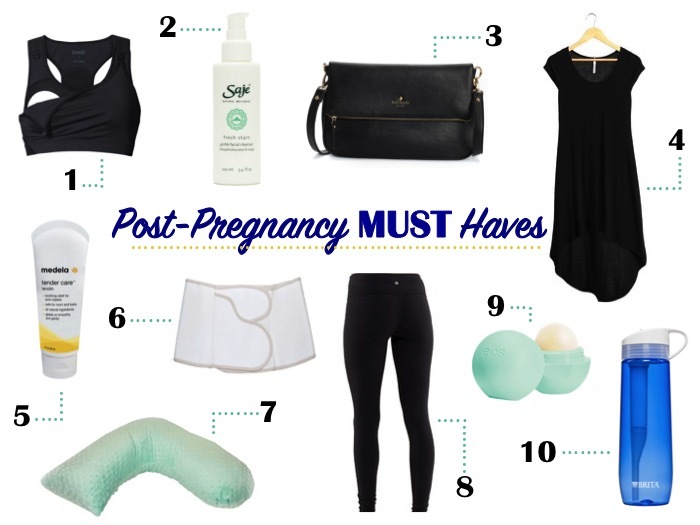 Definitely a must have for the next pregnancy but in the mean time the others did the trick! Jolly Jumper Nursing Pillow: I was originally going to register for this item and therefore not have it right from the beginning but I caught it on a sale and decided to grab it. Again, with the struggles related to breastfeeding I am glad I had this right when I came home from the hospital as it made things a lot easier. The Jolly Jumper brand has a great shape to it which hugs your body nicely, providing support for baby’s head. When I sit in my rocking chair in her nursery, the pillow rests on the arms of the chair, creating the perfect support and height for baby while nursing. LuLu Lemon Pants: I have a few pairs of these (I mean who doesn’t?!) but I spefically love my Wunder Under Hi Rise pair that has a fold down band at the waist. It gave me the option to wear it up at the beginning, providing the same tightening effect in the tummy region, or rolling it down later, once my body began to tighten up on its own. EOS Lip Balm: I love EOS lip balms and have been using them for about a year now. The sweet mint flavour is my favorite and I have always put it on right before bed. When waking up to breastfeed throughout the night I find that my lips are always dry and so I have kept this little guy on my nightstand since coming home from the hospital for quick application during feedings. Brita Water Bottle: I always drink water throughout the day but it seemed that the minute I found out I was pregnant I was drinking it non-stop and I haven’t slowed down yet. I found that I was always thirsty during pregnancy but even more so since breastfeeding. This water bottle doesn’t leave my side. It’s a great size, has a straw, doesn’t leak (so I can put it on the couch or bed next to me) and is super durable (I’ve dropped it quite a bit! ).